From March 21 through April 13, the Guerrilla Girls will take over the Wright Gallery in College Station as part of a thought provoking dual exhibition. Protest poster art from 1985-2000 by the anonymous feminist group will hang alongside New York artist/Pace University professor Robin Tewes’ latest painted series: “Men in Trouble.” The gallery will host an opening reception to kick off the show on March 22 from 4:30 PM to 6:30 PM with a special twist. 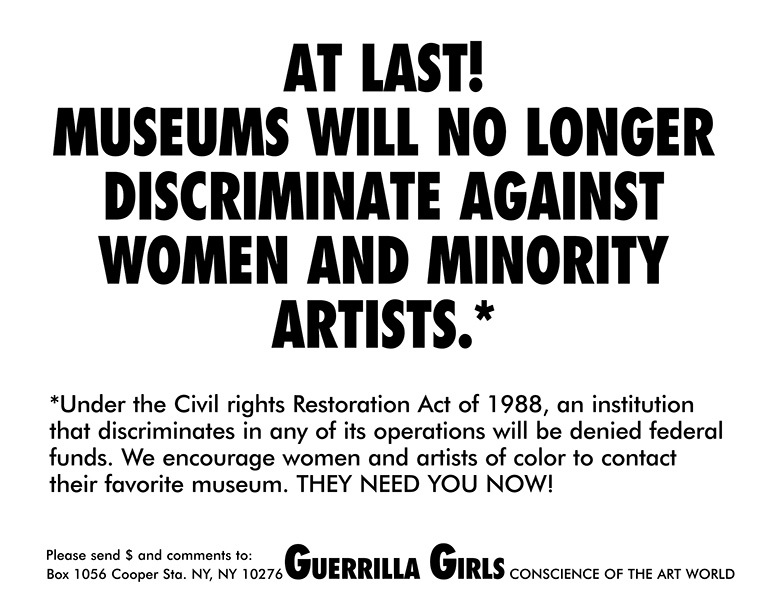 A Guerrilla Girl will be present to introduce the exhibit and will—for the first time ever in public—remove her mask to unveil her identity and talk about her role in the group as well as how activism manifests itself in art. Initiated in New York in 1985, Guerrilla Girls is an internationally recognized, anonymous group of feminist female artists whose goal is to fight sexism and racism in the art world. Members take pseudonyms of dead female artists, wear gorilla masks for anonymity and communality and use facts, humor, and outrageous visuals to expose discrimination and corruption in politics, art, film and pop culture. As an adjunct associate art professor of fine arts at Pace University, Robin Tewes addresses race, class and gender. The oil painter also challenges social norms through her art. Tewes’s figurative works challenge conventions of heroic masculinity by situating men in circumstances and conditions of compromise, vulnerability, crisis and ambiguity. “Men in Trouble” examines the fragility and vulnerability of the human experience. Her paintings create implied narratives with imagery drawn from the domestic world—juxtapositions of social interactions with surreal elements. Camouflage and absence work together throughout her series. 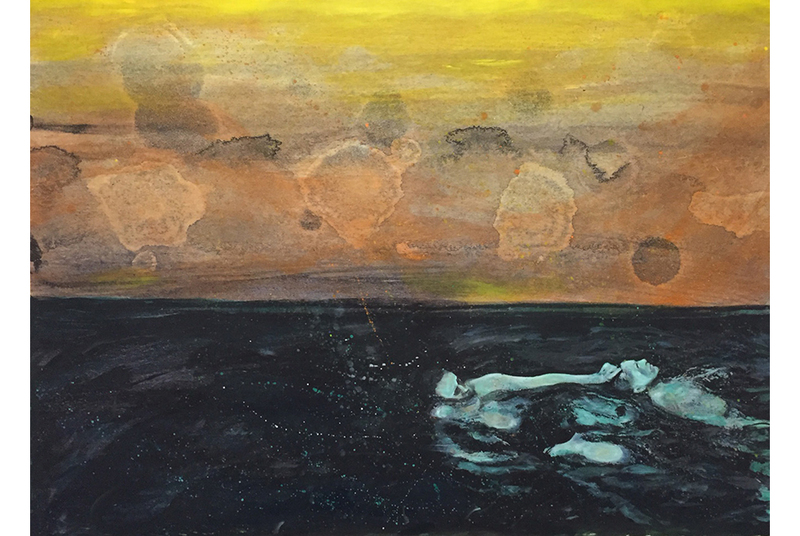 Tewes has exhibited nationally and internationally in galleries and museums such as The Whitney Biennial, Central Academy of Fine Arts in Beijing, The Snug Harbor Cultural Center Museum, The Norton Museum of Art, Pelham Art Center, The Weatherspoon Art Museum, The Aldridge Museum of Contemporary Art, The Baltimore Museum, LACE, The Hopper Museum, The Drawing Center, P.S. 1, The P.P.O.W. Gallery, White Columns, The Alternative Museum, The New Museum and Art in General. Her work has been reviewed in Artforum, Art in America, Artnews, Tema Celeste, Arts Magazine, The New York Times, The Drawing Society, The New Yorker, New York Magazine, Soho Weekly News and Village Voice. Guerrilla Girls / Robin Tewes is one of five shows this season at the Wright Gallery. The gallery is located at Texas A&M University’s College of Architecture at 3137 TAMU, Langford Architecture Building A, College Station, Texas 77843. Its hours of operation are 8 AM to 5 PM Monday through Friday (and weekends by appointment). Directions from Austin, Dallas and Houston are available on the College of Architecture’s website.